Wish you all a Very Happy Ganesh Chathurti!! May the Lord who is the remover of all obstacles bless you!! May all your endeavours be successful!! Back to back month of events and I am excited!! So calling Bloggers & non Bloggers to get into action make their favourite fast food in a healthier version and send them here!! · Only vegetarian entries - Not even eggs please! · A healthy version does NOT mean a less appealing version. · Up to 3 entries - all blogged during this period. · Use the Logo on your blog and link back to my blog here and Priya’s place. Awesome and useful explanation for this festival....happy ganesha chaturthi to u too! Happy hosting dear .. Happy Vinayaka Chaturthi to you too. Happy ganesh chathurthi Archana, happy hosting dear..
very happy ganesha chaturthi to you too. that explanation of symbolism is great. thanks for this information. Happy hosting & will send in my entries soon...And symbolism of Gamesh is so well explained...Thank u for posting it Archana!! 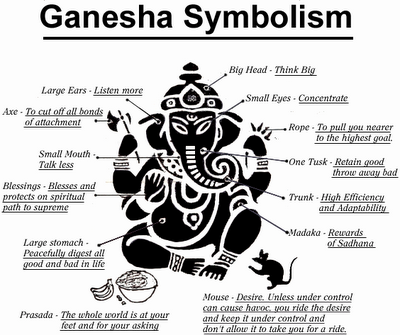 Ganesha symbolism is so true and great..happy hosting!! Just loved the symbolic representation.. Amazing! Nice event..happy hosting will check out.. Happy Vinayagar Chaturthi.. Happy hosting and nice informative post! Nice event and nice post. Hey nice event !! Will Try to send recipes ! check out my site too ! Will send in entry for this event. I've sent the entries by mail. but again i'm giving the details below. pictures cannot be loaded here. Dishes by me - CUCUMBER IDLIES ( VERY HEALTHY AS WATER CONTENT IS IN CUCUMBER AND GOOD TO PREVENT DEHYDRATION ), CABBAGE IDLIES ( VERY GOOD FOR THOSE WHO DO NOT LIKE CABBAGE A LOT ), PATHOLI ( STEAMED PAN CAKES ) - GOOD HEALTHY DISH AS IT IS PREPARED USING TURMERIC LEAVES. Happy hosting dear!!! This is my fav theme. I sure want to send something for this. Sending two of my entries dear! Hi,Just visiting ur blog,Very nice :).Joined the contest too :):) thanks if u accept me.